The phone rings and the person on the other end claims to be from your credit card company. The caller will give you some story that your card appears to have been used fraudulently, or that it has been compromised in some form. They will then ask you to confirm some personal information. They typically want information like your credit card number, credit card security code, social security number, or mother’s maiden name. Once they have the information they need, they may tell you that they will check into the issue and get back with you, but immediately upon ending the call, the scammer will use the information you gave to make charges on your account or to create a new account in your name. 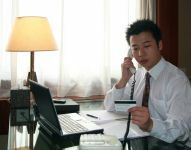 Credit card telephone scammers may also get you to call them by leaving the number on your answering machine or in an email. So, how to you protect yourself? First and foremost, don’t give out any information on calls you didn’t initiate, no matter how legitimate the call may seem. Scammers may even spoof your caller ID and have your creditor’s name show up. Don’t be “taken” by the new tricks. Only trust calls that you initiate by calling the customer service number on the back of your credit card or own your credit card billing statement. Additionally, don’t return calls from numbers left on your answering machine and especially those sent in an email. Although this is slightly off topic, I must add here; never click a link on a message sent to you from your bank or Credit Card Company! These links are made to look legit but are easily redirected to other site, more on that another time. Try as we may, it’s still easy to fall prey to a credit card telephone scam. If you’ve mistakenly given out your personal information, call your creditor immediately. You may be given a new credit card number to prevent fraudulent charges from being made on your account. Check your account regularly and report any suspicious activity. If you accidently gave out your social security number, place a fraud alert or security freeze on your credit report to prevent new accounts from being opened in your name. Monitor your credit report regularly and dispute any accounts that don’t belong to you.